This article is about Olimar's appearance in Super Smash Bros. Ultimate. For the character in other contexts, see Captain Olimar. Olimar (ピクミン＆オリマー, Pikmin & Olimar) is a playable character in Super Smash Bros. Ultimate. He was confirmed as a playable character on June 12th, 2018. In addition, Alph returns as an alternate costume for Olimar. Olimar is classified as fighter #40. 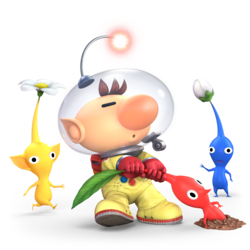 Olimar uses Pikmin to assist him in attacking his foes, with a core playstyle revolving around managing and using his various Pikmin combinations to his advantage. Voice samples for all Pikmin except Winged Pikmin are provided by Hajime Wakai, though recycled from the Pikmin games. Voice samples for the Winged Pikmin are provided by Atsuko Asahi. Play VS. matches, with Olimar being the 48th character to be unlocked. Clear Classic Mode with Mario or anyone in his unlock tree, being the last character unlocked. Have Olimar join the player's party in World of Light. With the exception of the third method, Olimar must then be defeated on Garden of Hope. Olimar was significantly improved from his iteration in Super Smash Bros. 4. His lackluster mobility was improved as he now has better run speed and better air speed. His already incredible ground game was also improved through his grab having more range, as well as his up smash having less ending lag, resulting in it being a terrifying combo option and kill move. Olimar's up throw was also significantly buffed to have similar knockback to Mewtwo's up throw. His notorious damage output was also buffed as all iterations of his Pikmin (excluding Purple Pikmin) have been buffed. His biggest flaw from Smash 4 was also fixed as his aerials now have Transcendent priority, which allows Olimar to trade moves much more safely than in Smash 4. Pikmin Pluck is faster as well, which allows Olimar to regain Pikmin faster. However, Olimar received some slight nerfs. His down throw launches opponents at a larger horizontal distance, making follow-up less reliable. Pikmin also have slightly lower hp making them die easier. He also now has the slowest initial dash in the game due to everyone else having their's more improved than his did. Regardless, Olimar's negligible nerfs are not enough to outweigh his buffs as he has already obtained incredible results in Ultimate's early metagame thanks to Dabuz, Shuton, Myran, and ImHip who have been very successful with him at top level tournaments. As a result, Olimar is often considered a top-tier character, if not one of the best characters in the game. As with all veterans returning from SSB4, Olimar's model features a more subdued color scheme. Alph's suit now features a lateral, zipper-like line down the center. Olimar's helmet cracks after taking a certain amount of damage, but will quickly be repaired. It also appears cracked when he is Screen KO'd. Pikmin now always face the screen regardless of which direction they turn. Pikmin now have trails that match their colors when attacking, like in the Pikmin games. Olimar now only jumps twice during his up taunt, shortening its duration. Olimar has a new sidestep animation. Olimar now hangs onto a ledge with one hand and his eyes now bulge outward rather than showing a neutral expression. Like all characters, Olimar's jumpsquat animation now takes three frames to complete (down from 5). Olimar walks faster (0.9 → 0.945). Olimar dashes much faster (1.47 → 1.617). Olimar's initial dash speed is slightly higher (1.6 → 1.606); however, it is now the slowest initial dash speed in the game due to the rest of the cast having their initial dash speed having been increased significantly more than Olimar's. Olimar's air speed is slightly higher (0.82 → 0.861). Health is lower for all Pikmin types (8 HP → 6 (R,Y), 11 HP → 8 (B), 7 HP → 5 (W), 13 HP → 11 (P). Unlike in Smash 4, Olimar's hurtbox is actually modeled around his body, instead of being a giant orb around him. This effectively gives him a smaller hurtbox around some parts of his body. Jab has slightly more end lag overall, meaning its harder to combo from it. Up tilt has slightly decreased end lag (frame 45 → 39). Up smash has significantly reduced end lag (frame 56 → 37) increasing its safety and giving it combo potential. Clean red, white and purple based up smash deal more damage (15.6% → 18.2% (R), 8% → 10.4% (W), 18.2% → 20.8% (P)). All aerials have less landing lag (15 frames → 13 (neutral), 15 frames → 9 (forward/back), 30 frames → 18 (up/down)). All aerials involving Pikmin now have Transcendent priority. All aerials that use Pikmin have increased range. Up and down aerials auto-cancel one frame later (frame 30 → 31). All Pikmin in Olimar's squad will be used at once for his grab, significantly improving its potential range. The more Pikmin he has, the greater the range. All grabs have slightly increased ending lag. Olimar's pummel is now a quick upward punch from Olimar himself. It is much faster than his previous pummel, but deals less damage. Olimar can no longer benefit from the high-damaging pummel of White Pikmin. Up throw has a more exaggerated animation. Olimar's down throw launches opponents at a larger horizontal distance, making follow-up less reliable. Pikmin Pluck executes much faster. Pikmin that latch onto opponents via Pikmin Throw deal more damage (Red, Yellow, and Blue Pikmin (1.1% → 2%), White Pikmin (3.7% → 4.6%)). Opponents now express when a Pikmin is latched onto them. Purple Pikmin thrown via Pikmin Throw deals less damage (6.5% → 6%). The removal of multiple player slot glitch and changes to jostle mechanics no longer crashes the game with Pikmin Throw. Pikmin Order is noticeably faster. Pikmin Order's whistling animation is less exaggerated. End of Day has been significantly sped up, with the Hocotate Ship crashing onto the stage almost immediately after the move's cutscene. Olimar has been affected in the 1.2.0 update. What was changed however is currently unknown. Fixed a bug where Pikmin would apply attack multiplier twice when using spirits. Introduced a bug where Olimar's smash attacks are unaffected by charging them. Forward smash deals less shield damage. Olimar's smash attacks now properly have their damage scale when charged. The universal change where perfect shielding a projectile has less ending lag makes Olimar's smash attacks less safe after a perfect shield. Pikmin Throw deals less shield damage. All of Olimar's Pikmin as shown by a Skill Preview in Ultimate. “ Each of the Pikmin have different qualities, depending on their color. 3% (arm), 4% (fist) — The Rocket Fist's one-two combo. It has very minimal start-up and ending lag, average knockback growth, and its second hit launches at 45°. At low percents, can combo into down tilt. 11% — The Rocket Fist's wind-up punch. It is powerful for a tilt attack, thanks to its decent damage output and high knockback growth. 0.6% (hits 1-5), 4% (hit 6) — A jumping twirl. Hits multiple times, with its last hit having very high knockback growth. Altogether, these traits make it a decent anti-air attack. 6% — A sliding tackle. It hits on frame 6, and has very low base knockback, very high knockback growth, and minimal ending lag. Altogether, these traits make it a reliable combo starter at low to medium percents. It can combo into itself (especially on fast-fallers), up tilt, smash attacks, and aerial attacks, depending on the opponent's DI. It can also interfere with an opponent's edge grab attempt, thanks to its hitbox being capable of going below the edge. Like neutral attack, performing it repeatedly will move the user slightly forward. 7% (hit 1), 4% (hit 2) — A cartwheel. It can function as a mix-up, as it is able combo into up aerial at 0%-10%. However, its second hit's very low damage output, high base knockback, and low knockback growth collectively make it unable to combo past very low percents, or KO at reasonable percents. — 8.4% (far)/ 14% (mid)/ 20.3% (close) 6% (far)/ 10% (mid)/ 14.5% (close) 6% (far)/ 10% (mid)/ 14.5% (close) 4.8% (far)/ 8% (mid)/ 11.6% (close) 9.6% (far)/ 16% (mid)/ 23.2% (close) Points forward to command a Pikmin to leap forward and perform a corkscrew tackle. The leaping Pikmin can be reflected. — 14% (mid)/ 18.2% (close) 10% (mid)/ 13% (close) 10% (mid)/ 13% (close) 8% (mid)/ 10.4% (close) 16% (mid)/ 20.7% (close) Points upward to command a Pikmin to jump and perform a cartwheeling tackle. The leaping Pikmin can be reflected. This move has uses in starting combos at low to mid percents; depending on the opponent's character, any aerial can be used out of an up smash. Notably, an up air chain out from an up smash, leading to an extremely damaging combo. Its short endlag and high shieldstun make the move difficult to punish on whiff and shield. Up smash is also a good out of shield option due to its deceptively good horizontal range and great vertical range and duration, making it useful for punishing landings and occasionally juggling opponents. Up smash is also a strong killing move, KOing at or below 150% with all Pikmin except white. However, it can easily be beaten due to its projectile attributes, making them lose out to any other active hitbox. This up smash is one of the best if not the single best up smash in the game, and is a strong contender for one of the best moves in the game as a whole. Pikmin Left/Right Dash — 12.6% (mid)/ 15.4% (close) 9% (mid)/ 11% (close) 9% (mid)/ 11% (close) 7.2% (mid)/ 8.8% (close) (mid)/ 17.6% (close) Squats slightly and points to both of his sides to command two Pikmin (the lead Pikmin, and the Pikmin next in line) perform dashing tackles. Either Pikmin on each side can be reflected. Tornado Attack 1.5% (hits 1-4), 2% (hit 5) — A jumping twirl, resembling his up tilt. It is Olimar's only aerial that does not use Pikmin, or have transcendent priority. However, it lacks KO potential like his other aerials. — 11.9% 8.5% 8.5% 6.8% 13.6% Grabs a Pikmin by its stem and swings it downward in front of himself. Due to its' range, and speed, it's one of Olimar's best moves for walling and aerial combat as the Pikmin used acts as a sword for the duration of this move, giving this move great range relative to Olimar's size. Due to its' low landing lag it's also very good for combos at lower percents as well as being safe on shield if spaced well. In addition, it can also kill if used with purple or red Pikmin. Lastly it is a very reliable follow-up from down throw, and is useful for edge-guarding. — 15.1% 10.8% 10.8% 8.6% 17.2% Grabs a Pikmin by its stem and swings it upward behind himself. It is Olimar's and Alph’a most damaging aerial. Due to its' low landing lag it's also very good for combos at lower percents as well as being safe on shield if spaced well. This move has great range for a character of Olimar's size, due to the Pikmin used acting as a sword for the duration of this move. it can also kill at reasonable percents if any Pikmin bar white are used. However, it has the highest start-up lag out of his aerials, though the startup is still reasonable compared to most other back airs of it's type. — 12.6% 9% 9% 7.1% 14.3% Grabs a Pikmin by its stem and twirls it upward. The move comes out decently fast and lasts for a very long time, as well as the move having transcendent priority, making it very hard to out-space this move making it very good for juggling and combos, at lower percents it can chain into itself or other aerials bar down air. It is tied with down aerial as his second most damaging aerial, and is a viable KOing option with any Pikmin bar white. However, it has a noticeable amount of landing lag. — 12.6% 9% 9% 7.1% 14.3% Grabs a Pikmin by its stem and swings it downward. It is tied with up aerial as his second most damaging aerial. This move gives Olimar a very good way to escape juggling due to the long lasting hitbox and the amount of downwards range that it gives Olimar, the Pikmin act as a pseudo disjoint in this move as well as all of Olimar's other Pikmin involved aerials, making it very hard to challenge the move during its active hitbox frames. The move can also kill at higher percents if used with red or purple Pikmin. It is also a meteor smash, but only against aerial opponents and during its first frame. In addition, the move's very long lasting hitbox can also two frame punish at ledges. However, it has a noticeable amount of landing lag. — Points forward to command the lead Pikmin to grab the opponent. The Pikmin function as disjointed grabs, and overall grab range varies depending on both the number of Pikmin present, and the lead Pikmin. White Pikmin have the longest range, followed by Red, Yellow and Blue (which are all tied for 2nd), and Purple (with the shortest range). With 3 Pikmin present, and the lead being a White Pikmin, this grab has the longest range in the game. Decently fast for it's range. 1% — Punches the opponent. Faster but weaker than his previous pummel. — 6.7% (3 Pikmin), 6.1% (2 Pikmin), 5.5% (1 Pikmin) 8.4% (3 Pikmin), 7.7% (2 Pikmin), 7% (1 Pikmin) 14.2% (3 Pikmin), 13% (2 Pikmin), 11.8% (1 Pikmin) 8.4% (3 Pikmin), 7.7% (2 Pikmin), 7% (1 Pikmin) 8.4% (3 Pikmin), 7.7% (2 Pikmin), 7% (1 Pikmin) The Pikmin leap forward, body slamming the opponent on the ground. — 8.6% (3 Pikmin), 7.9% (2 Pikmin), 7.1% (1 Pikmin) 10.8% (3 Pikmin), 9.9% (2 Pikmin), 9% (1 Pikmin) 18.3% (3 Pikmin), 16.8% (2 Pikmin), 15.3% (1 Pikmin) 10.8% (3 Pikmin), 9.9% (2 Pikmin), 9% (1 Pikmin) 10.8% (3 Pikmin), 9.9% (2 Pikmin), 9% (1 Pikmin) Same as the forward throw, but the Pikmin leap backwards instead. If 3 Pikmin are present, and the lead Pikmin is blue, it is one of Olimar's most damaging throws. — 1.2% (hit), 6.4% (throw) (3 Pikmin) / 1.1% (hit), 5.9% (throw) (2 Pikmin) / 1% (hit), 5.4% (throw) (1 Pikmin) 1.2% (hit), 8.4% (throw) (3 Pikmin) / 1.1% (hit), 7.7% (throw) (2 Pikmin) / 1% (hit), 7% (throw) (1 Pikmin) 1.2% (hit), 15% (throw) (3 Pikmin) / 1.1% (hit), 13.7% (throw) (2 Pikmin) / 1% (hit), 12.5% (throw) (1 Pikmin) 1.2% (hit), 8.4% (throw) (3 Pikmin) / 1.1% (hit), 7.7% (throw) (2 Pikmin) / 1% (hit), 7% (throw) (1 Pikmin) 1.2% (hit), 8.4% (throw) (3 Pikmin) / 1.1% (hit), 7.7% (throw) (2 Pikmin) / 1% (hit), 7% (throw) (1 Pikmin) The Pikmin toss the opponent upward, then leap up and headbutt them further upward. — 1.2% (slam), 6.7% (throw) (3 Pikmin) / 1.1% (slam), 6.1% (throw) (2 Pikmin) / 1% (slam), 5.5% (throw) (1 Pikmin) 1.2% (slam), 8.4% (throw) (3 Pikmin) / 1.1% (slam), 7.7% (throw) (2 Pikmin) / 1% (slam), 7% (throw) (1 Pikmin) 1.2% (slam), 14.2% (throw) (3 Pikmin) / 1.1% (slam), 13% (throw) (2 Pikmin) / 1% (slam), 11.8% (throw) (1 Pikmin) 1.2% (slam), 8.4% (throw) (3 Pikmin) / 1.1% (slam), 7.7% (throw) (2 Pikmin) / 1% (slam), 7% (throw) (1 Pikmin) 1.2% (slam), 8.4% (throw) (3 Pikmin) / 1.1% (slam), 7.7% (throw) (2 Pikmin) / 1% (slam), 7% (throw) (1 Pikmin) The Pikmin perform a leaping piledriver. 7% — Headbutts in front and then behind himself. 7% — Punches in front of himself and then spins around to punch behind him. 9% — Throws a punch while climbing up. Pikmin Pluck — Plucks a Pikmin. It cannot be used in midair, and has noticeable ending lag if it is attempted in midair, or if no more Pikmin can be plucked. Pikmin Throw — 2% (per hit) 2% (per hit) 2% (per hit) 4.6% (per hit) 6% Throws a Pikmin, which latches onto opponents and damages them before falling off either because of flinching, the opponent's damage, or being killed. In regard to the opponent's damage, a Pikmin's latch duration decreases when the opponent's damage increases, even when undisturbed. Due to the Purple Pikmin's inability to latch onto anything like in their home series, they will instead deal damage on contact. Winged Pikmin — Two Winged Pikmin carry the user around. Winged Pikmin's effectiveness is dependent on both the amount of Pikmin that are alive and close, and the frequency of its usage. In regard to frequency, it takes approximately 3 seconds (180 frames) for Winged Pikmin to be able to travel the same distance again after the conclusion of the initial usage. Aerial attacks can also be used while being carried, similarly to Wings of Icarus. However, doing so will render him helpless immediately after the conclusion of the attack. Pikmin Order — Blows his whistle to recall Pikmin and/or sort out their order in the line. It grants super armor, which lasts from startup to before Olimar's antenna emits the blue lights. It has a very low amount of endlag, and can even be cancelled (just before the lights turn from yellow to red). End of Day 10% (launch), 10% (ascent), 15.1% (Red Bulborbs), 10% (descent), 12%/10% (explosion) Jumps into the Hocotate Ship and launches into outer space, which buries any nearby opponents. While the ship has left the stage, Red Bulborbs attack opponents to steadily inflict damage. The Hocotate Ship then descends from outer space, and explodes upon crash landing onto the stage. The duration of the whole Final Smash is faster than in SSB4. Up taunt: Joyfully jumps in place. Down taunt: Swings his hips twice. Performs a toe touching exercise while a Yellow Pikmin rests on the ground and a Red Pikmin looks around, waving its arms, and occasionally jumping. A flourished remix of a small excerpt of the title theme of Pikmin. Coco - The best Olimar player in Michigan. Placed 5th at Holiday Heist 4: Ultimate Edition. Dabuz - One of the best Olimar players in the world. Placed 5th at Smash Conference United, 2nd at Let's Make Moves, and 4th at GENESIS 6. ImHip - One of the best Olimar players in the United States. He caused a major upset at GENESIS 6 with a win on Glutonny and placed 33rd there. Also placed 7th at Heart of Battle and 17th at SoCal Chronicles. Klaatu - Placed 7th at Super Splat Bros and 33rd at GENESIS 6. Myran - One of the best Olimar players in the world. Placed 7th at Smash Conference United, 9th at GENESIS 6 and 3rd at Frostbite 2019. Rich Brown - 13th at Heart of Battle, 17th at SoCal Chronicles, and 65th at GENESIS 6. Shuton - One of the best Olimar players in the world. Placed 1st at Umebura SP, 1st at 2GG: Prime Saga, 2nd at Umebura SP 2, 4th at Frostbite 2019, and 13th at GENESIS 6. Olimar faces off against characters who are space travelers in their respective series. 3 Kirby and King Dedede Dream Land Planet Popstar This battle is a free-for-all, and Kirby and King Dedede will primarily target each-other. 6 Alph Distant Planet Garden of Hope When playing as Alph, the opponent is Olimar. Although Olimar does not appear in the World of Light opening cutscene, he was vaporized and later imprisoned alongside the rest of the fighters (except Kirby) when Galeem unleashed his beams of light. Olimar can be found in the mode by choosing to save Marth instead of Sheik or Villager. The spirit of a magician is needed in order to enlarge some mushrooms to reach him. Olimar's Fighter Spirit can be obtained by completing Classic Mode. It is also available periodically for purchase in the shop for 500 coins. Unlocking Olimar in World of Light allows the player to preview the spirit below in the Spirit List under the name "???". As a Fighter Spirit, it cannot be used in Spirit Battles and is purely aesthetic. Each Fighter Spirit has an alternate version that replaces them with their artwork in Ultimate. Additionally, due to being an alternate swap, Alph has his Spirit count as another Fighter Spirit. Each type of Pikmin also possess a spirit of their own, as either Primary or Support Spirits. Olimar using his forward smash on The Great Cave Offensive. With Mario, Pac-Man, and Sonic on Gaur Plain. Ascending with Winged Pikmin in his red costume with Alph on Wuhu Island. Ascending with Winged Pikmin on Kongo Falls. Idling with Luigi on Distant Planet. The Red, Yellow, Blue, White, and Purple Pikmin on Distant Planet. Pikmin with Mewtwo on Onett. Pikmin with the Mii Fighters on Find Mii. A shrunken Olimar being held by Pac-Man on Distant Planet. A Red Pikmin with Richter on Distant Planet. Olimar getting attacked by the fish on Summit. In his green costume on Temple. During the official Ultimate website's launch on June 12th, 2018, Olimar's name was erroneously labeled as "OLIMER" in English variants of his fighter page. The typo was later corrected. The part of Olimar's showcase trailer where Alph crouches next to a prone Olimar is a reference to a scene in Pikmin 3 after Alph initially rescues Olimar from the Mysterious Life Form. Olimar's (and Alph's) official artwork resembles Brittany's pose in her Pikmin 3 artwork, albeit flipped. In World of Light, Olimar and the Mii Fighters will never be spawned as a false character in battles with Galeem and Dharkon. While Kirby will also not appear, he is an exception, as he was never initially imprisioned. Olimar is the only fighter to have an alternate costume of a different character in the same pose as his default costume, excluding the Mii Fighters. There appears to be a new glitch from update 2.0.0 where, if Olimar's Pikmin latch onto something and it changes size with them still latched on, they will change size, too. This is most noticeable with the Mother Brain, though Super and Poison Mushrooms will also do this, as long as they are applied by the character the Pikmin are latched onto. 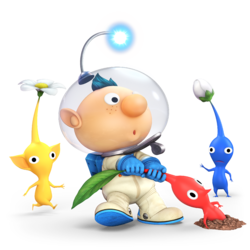 While Olimar’s default costume is never used in any spirit battles, Alph’s default costume is. This technically makes him one of the five characters to use a "default" costume in spirit battles, the others being Yoshi, Mr. Game & Watch, Bowser Jr., Joker, Robin, Inkling and female Corrin, although Alph and female Corrin are merely alternate characters using their “default” colors. Furthermore, while Olimar technically appears in four Spirit battles, three of them use Alph instead. The only one that features Olimar himself features him as an ally instead of an enemy. This specifically makes Olimar one of two non-DLC fighters that are never directly fought in any Spirit battles, the other being Pokemon Trainer. This page was last edited on April 22, 2019, at 10:52.